With Invisalign and functional orthodontics, I like to find the most comfortable, stable and healthy position for a patient’s facial joints, muscles and teeth. Using functional orthodontics accomplishes those three things. For example, it addresses how the position of your teeth affect your speaking, eating, chewing and swallowing. It can also relieve jaw joint pain by reducing muscle strain. 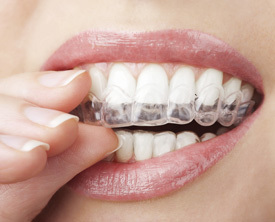 When I do Invisalign we want to make sure I’m looking at those things, not just straightening your teeth. I want to ensure your joints are healthy, and the muscles are functioning properly and not being overstressed. I received my orthodontic certification through the American Orthodontic Society where I learned how to use braces to straighten teeth. Because of that, I’ve been taught how to read the radiographs and study the relationship of where the bone is to the teeth. Functional orthodontics is not only about straightening your teeth but about how your jaw functions, how your tongue is placed, and all the other factors involved in improving overall oral health and stability. When I first studied the Invisalign system, the only focus was on teeth straightening; we didn’t look at expanding the jaw, mouth and teeth. Because of my understanding of functional orthodontics, I now set up my Invisalign treatment to expand the arches, and try to get more space and volume so we can give the tongue more room. Typically, I will figure out the parameters for expansion first and set that up from the beginning in my aligner instructions. Then if I need to reduce contact between individual teeth, that is secondary to the priority of expansion. I also look at my X-rays and photos and see if I can expand even further within the Invisalign software. (The software itself is just looking at the scans and not necessarily taking into consideration the jawbone and the tissues.) By approaching each case this way, I have a lot more control in terms of where I want the teeth to be positioned in their final relationship to each other. Because I practice functional orthodontics I’ve been able to help incorporate TMJ treatments into care and have been able to help people decrease their snoring, increase their sleep and improve the quality of their sleep. I’ve also helped people with headaches and migraines. Sometimes a patient’s gum disease gets better as well because of the type of orthodontics. Gum disease can improve because of the spaces between the teeth. For example, inflammation can take place when the teeth are crowded, and the toothbrush can’t clean every area of the mouth. As a result, bacteria build up. By balancing out your bite with functional orthodontics, you can reduce the amount of inflammation and get better results from your periodontal therapy. If you think you could benefit from Invisalign and functional orthodontics, contact us today to set up a consultation!